Selecting a tankless water heater may be a headache for some with the many brands out in the market today. Thankfully, we are given a criterion that makes it easier to choose: the tankless water heater’s capability to control the amount of energy used. This is what separates Ecosmart from all the rest; it has patented its self modulating technology. And the ECO 18 water heater beats its competition in the same class. With the self modulating technology, the ECO 18 doesn’t produce spikes in your electrical consumption. It uses a flow sensor that ensures just the right amount of energy for your actual use. And while most tankless water heaters activate at a water flow between 0.75 and 1 gallon per minute (GPM), the ECO 18 activates as low as at 0.25 GPM. This means that this water heater is a perfect candidate if you’re living somewhere with below average water pressure. The space-saving Ecosmart ECO 18 is designed for use in areas with at least 62oF incoming water temperature and is capable of heating 2.5 GPM. With 62oF inlet water temperature, that translates to one shower and one sink. If you live in the South, you can even run two showers because of the 70oF+ incoming water temperature. And with the digital temperature control, you can easily set your preferred temperature and leave it at that…forever. The unit’s heating elements have brass tops to prevent electrolysis, and both the exhange tops and the heating elements are made of stainless steel (or copper). Unlike heating elements used by other manufacturers, these parts are reliable and easily replaceable should they malfunction. The unit comes with a good manual to facilitate proper installation. It would do quite well with retrofitting but this involves a closer inspection of your current electrical set up and acquiring additional equipment and parts to meet the unit’s electrical demands. The carefully chosen heating components offer 99.8% energy efficiency. This translates to energy savings of 60%, which is about 25% of your total electric bill. Owners have reported monthly savings of up to $75. Ecosmart’s customer service is highly responsive and can offer you alternatives and/or solutions to your inquiries. You can easily get in touch with them online or via phone. The unit retails for $469, but you can get them at slightly lower prices online (check current pricing below). Because the warranty requires a licensed electrician and plumber to install the unit, you may need to shell out an additional $500 just for their services. Also, factor in the cost of electrical parts that you may require. 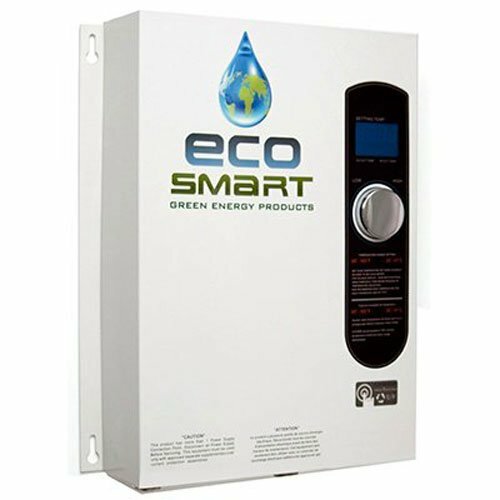 Undoubtedly, the Ecosmart ECO 18 kw Electric Tankless Water Heater is a good choice, its merits greatly overpower its downsides.